An aerial view shows the Zaatari refugee camp in Jordan where 115,000 Syrian refugees stay. Sweden is known worldwide as a country of technology, ingenuity and practical solutions, I mean what’s the first thing that comes to mind when you mention Sweden? IKEA of course – the embodiment of the word “practical”. However, there is one aspect of Sweden that is everything but practical and that is the logic put forth by politicians and opinion leaders in media regarding the subject of immigration and refugees. This article is really for Swedes and had I retained my Swedish writing skills I would have opted to write it in Swedish, but as 25 years abroad has taken its toll on my Swedish language skills, you will have to suffer through the English. Most of the source data and links are however in Swedish. Since the Second World War Swedes have enjoyed a political system whereby subsidies out of tax money is paid for various situations so that by own choice it has been practically impossible not to survive. Social welfare exists in many countries even if Sweden’s is among the most accommodating. Where Sweden differs however is that many of these subsidies are also offered to asylum seekers for the duration they are staying waiting to hear back on their asylum status. The exact amounts vary based on the circumstances but as an example, a family with 2 adults and 3 children which is housed in a private housing, i.e. not a refugee-center, receives as a family about 7,500 SEK every month in government hand-outs. As of this writing 1 SEK is about 0.12 USD or 0.11 Euro. This is in addition to the cost the government pays the landlord for the private housing which in some rare cases has been as much as 1,550 SEK per day for a student room, or 46,500 SEK per month. Of course that was an extreme case, but to give an idea of the orders of magnitude, only one municipality, Mölndal, received 276 million SEK in one year from state tax payer’s money to house refugees and migrants. Sweden has 290 municipalities. Another unique thing about Sweden is that since 2013 Syrians refugees who have been verified gets permanent residency (PUT – Permanent UppehållsTillstånd). Not only do Syrian refugees get PUT by their immediate family and relatives are eligible for PUT as well. The standard in Europe is to give them temporary residency. The fact that temporary residency is the norm is not unexpected as the very definition of refugee status per UNHCR also includes when the status ceases. The Swedish law that covers this can be found here which states that Migrationsverket is responsible to determine who can receive PUT. Another aspect which makes Sweden stand out like the moon in perihelion is the amount of refugees per capita it has taken in over recent years. According to both the OECD index and the EUROSTAT index, Sweden takes in twice as much per capita as the second runner up, or more than all the other Nordic countries combined. Is this because Sweden approves a higher amount of refugees than its Nordic neighbors? No. The approval rate of refugee seekers among Nordic countries tells a different story. Iceland rejected zero (0) in 2014. Finland rejected a much smaller portion of its asylum applicants compared to Norway and Denmark who only rejected about 10% more than Sweden did. Therefore there must be a different reason why Sweden ends up taking in more asylum seekers per capita than all of its Nordic neighbors combined. Now, nobody has gone around and surveyed the approx 600,000 refugee seekers spread throughout Europe and asked them if and why they would like to come to Sweden. Therefore only conjecture can start to answer this question, something I will not attempt to do. The vast majority of Swedish “debates” around these topics come from those who feel threatened by immigration, the “realists”, or, from those who consider any opposition to immigration as racist, the “humanists”. The immigration rules for refugees and especially Syrians are uniquely accommodating in Sweden compared to ANY other country in the world. I haven’t reviewed every rule of every country but I believe I’m pretty safe to say that Sweden among all countries has the most generous refugee conditions and “porous” border controls in the world, especially for Syrians. Sweden has THE most generous immigration by family members for refugees, with hardly any demand for provision by the family member bringing relatives from their home country in many circumstances, especially as applied in practice. 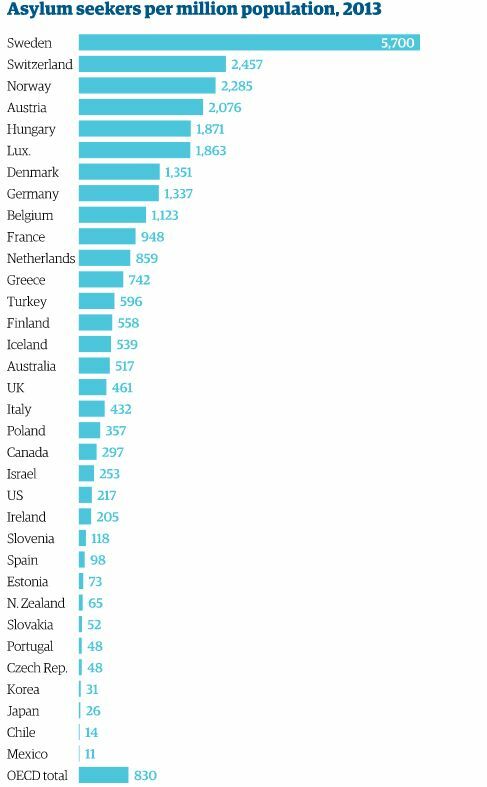 Sweden has THE most generous conditions for those who despite all get their asylum application denied. Sweden, comparatively in Europe, has a relaxed control of new refugees as far as verifying age and granting asylum and even PUT for Syrians despite lack of passport or documentation proving the age or national origin of the person. Sweden has one of the most generous benefit systems with paid retroactive parental benefits as well as pension paid to elderly at age 65 even if the person in question was granted a permanent residence at age 64 and never contributed a single cent to the tax and pension system. As far as the last example I don’t know how else to make the rule without becoming arbitrary which I fully understand, but the combined benefits of the Swedish system for refugees granted residency, especially Syrians, are as a whole utterly unique to Sweden. The realists echo strong voices arguing that these very accommodating benefits for Syrian refugees and the promise of PUT (Permanent Residency) for Syrians are the primary reasons why Syrians seek out especially Sweden. Some humanists argue that many family members, relatives and friends are already in Sweden so others naturally seek to be with those whom they already know. The humanists also argue that Sweden’s benefits for Syrians is an example for the rest of the world to follow and that the rest of the world is less humane in this respect. Some humanists and anti-racists (as they like to call themselves) argue that to even question Sweden’s refugee rules and benefits or to not subscribe to this set of values (värdegrund) is to admit to being a racist. The Swedish anti-racist movement seeks to present this stance as a new “normal”, and attributes those who question it as divergent and extreme. “Right extremism” (högerextremism) is the more common designation or label which is assigned to those who do not subscribe to the current refugee and immigration norms and politics. Had I been in the same boat I would have probably reasoned the same. I want to start with something that inspired me from a personal post by a Swede on facebook. To make a point about only using one’s heart versus having both heart and economic and pragmatic planning, this girl describes a good-hearted woman who starts to take care of stray cats but her heart takes over any and all logic and soon this woman is a personal wreck with dead or dying cats everywhere she looks. A similar actual story that occurred in Hong Kong is worth considering. A normal working woman lived in a village house in the outskirts of Hong Kong and she used to feed the many stray dogs which lived around the village. Hong Kong has a serious problem with an over-population of stray dogs. The woman started to let dogs live in her house. Soon others in the village who kept dogs started to give the woman their litter when their own dogs replicated outside of their control. Within a year the woman was keeping near 20 dogs and puppies in and around her house. The woman started a charity to raise funds for a small enclosure to be able to shelter more dogs as well as being able to have enough money to feed the dogs. She took a loan and got an enclosure built outside her house. She took in more and more dogs and several were not neutered and they started to replicate. Within only a few years the number of dogs had grown to a hundred and she needed help just to feed them which some volunteers helped her with but she had way too many dogs to be able to get each individual dog the proper veterinary treatment as well as the proper hygiene. Despite the conditions in her shelter her good heart just couldn’t say “no” when a new rescued dog was dropped off and the numbers kept increasing. Her entire house, garden and shelter was full of hundreds of dogs which started to contract diseases as the hygiene conditions and close proximity to other dogs became impossible to manage. But the woman with her good heart kept rescuing more dogs. Several dogs had a skin disease called mange and soon the majority of dogs contracted mange. Eventually a citizen reported the woman and her shelter to the authorities which sent a health inspector to the facility. A few days later the place was closed down. The few dogs still in a decent condition were turned over to some public shelters but the majority of disease-ridden dogs were rounded up by the AFCD, the authority over pets in Hong Kong, and kept for a few weeks to see if anyone wanted to adopt. As there are many more rescue dogs than potential adopters the many of these dogs had to be put to sleep. The moral of the story: Just a good heart isn’t enough to take care of others. A good heart is a requirement to take care of others, but a large-scale operation has to also consider all other economic, resource and logistics factors in direct ratio and direct proportion to the numbers being taken care of, or the system will collapse unto itself. That’s a stereotypical anti-racist message focusing exclusively on empathy, compassion and help. These are vital factors in dealing with any human matters, but please, you someone who loves to misread the wrong context into something – I am not equaling immigrants to dogs, nor saying the Swedish immigration system is like a crumbling dog shelter. But I’m using this as an example to illustrate that empathy and care alone will not be able to handle and sustain such situations and therefore these terrible words like “volumes” and “cost” have to also be considered. In my estimation, the very large majority of news articles as well as chronicles by opinion leaders tend to focus either exclusively on empathy, charity and help or the volume, cost and social problems resulting from the immigration. But to properly tackle such a large subject as refugees and beggars one has to consider ALL of these factors at the same time WITH a good heart but MANAGED with logic, common sense and costs and numbers well considered and acted upon. Though there are roughly 60 million refugees in the world today, I will focus on displaced Syrians who comprise around 40 per cent (the largest single component) of the people seeking to enter Europe through ways such as dangerous boats across the Mediterranean. Around 10 million Syrians are displaced; of these around 5 million have fled Syria. 5 million are still displaced inside Syria. Of the other 5 million who have fled Syria, around 2 per cent get on boats for Europe. This small group is unlikely to be the most needy in many cases. To get a place on a boat you need to be highly mobile, and sufficiently affluent to pay several thousand dollars to a people smuggler. Most of these “boat people” started as refugees in neighboring countries: Jordan, Lebanon and Turkey. 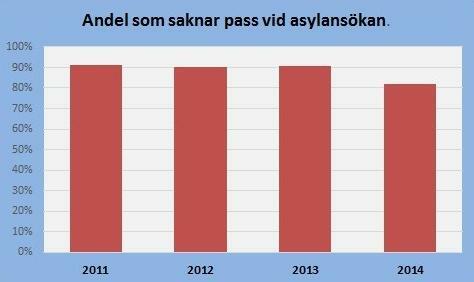 About 80,000 applied for asylum in Sweden in 2014. Of these 30,583 were Syrians. To give some comparisons in rough figures; in 2010 there were 44 million refugees worldwide. According to UNHCR around 10,000 took the route across the Mediterranean. 20 died on the way. In 2013 the total number of refugees worldwide was 51 million. 60,000 went across the sea and 600 died. In 2015 there are 60 million refugees worldwide and so far (though August) this year 400,000 have crossed the Mediterranean and so far 2,800 have died at sea. Now let’s look at who does cross the Mediterranean. According to UNHCR, in 2015 almost half of the refugees are Syrians. The other majorities come from Afghanistan, Eritrea, Nigeria, Somalia, Pakistan, Iraq, Sudan, Gambia and Bangladesh. Historically refugees are associated with women, children and the elderly, but in this recent wave of refugees from mainly Syria but other MENA countries, 72% are men, 13% women and 15% children and minors. Just this year Sweden has received more asylum seekers from Afghanistan than during any of the years a full scale war was raging in that country. To get an asylum visa in Sweden you can only apply for it once in Sweden. Some have argued that being able to apply for a Swedish asylum visa in Swedish embassies would prevent the otherwise hazardous journey, often facilitated by people smuggler. The latest report from the Swedish government states that there is no plan for this to occur. The Syria regional refugee response plan is only funded to 35% of the $1.3bn needed to support refugees, both in the camps and by providing resilience funding for the countries hosting them. In Africa, where the crises in the Central African Republic and South Sudan do not often make international headlines, many funding appeals are less than 15% full. Experts say the current system, with constant emergency appeals to keep supply chains running month by month, must be changed to acknowledge that the situations in Syria, Iraq, Yemen and Central African Republic are all deteriorating and need long-term funding. In August, a multi-million dollar shortfall forced the World Health Organisation to close down 184 health clinics across 10 of Iraq’s 18 districts, in an area that has seen severe fighting and massive internal displacement. The cuts have left three million people without access to healthcare. The World Health Organisation is trying to raise $60m to fund healthcare in Iraq but so far only $5.1m has been given by donors. Dr Michelle Gayer is director for emergency risk management at the WHO. She told the Guardian that the gap between the desperate need in countries such as Iraq and current funding levels risked permanent damage to public health across whole populations. If you add up the total costs for all refugee programs, food and medicine for the 60 million refugees worldwide, that cost is about 200 billion SEK (200 miljader kronor) or $24 billion USD. 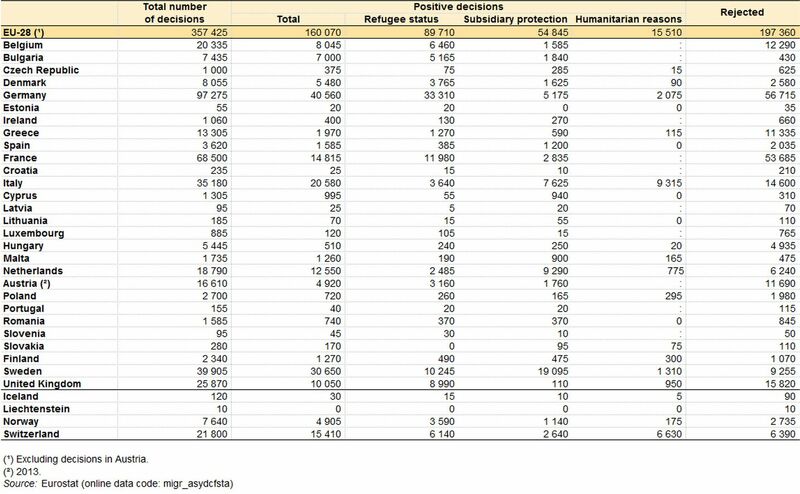 As a comparison, in 2014 Sweden received about 48,700 refugees and asylum seekers if you combine all the various categories which cover people in need. The estimated total cost to take care of these 48,700 is 40 – 70 billion SEK depending on what source of costs you use. Another comparison, to reach the total budget required for Lebanon to take care of its 1.8 million refugees is 6 billion SEK. 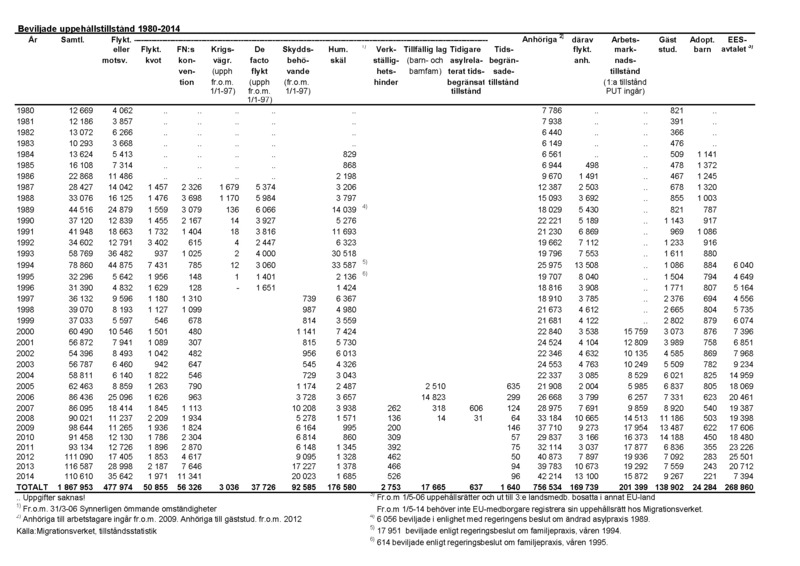 The cost for the initial intake of asylum seekers was about 12 billion SEK in 2010. The estimated cost for 2015 is 34 billion SEK. In 2010 the 12 billion SEK was partially covered by reducing the budget cost for aid and relief support by 2 billion SEK. In 2015 the 34 billion is partially covered by reducing aid and relief support by 12 billion. That’s a 600% decrease in relief and aid funding in 5 years. To make the numbers simple, according to the 2015 budgets Sweden has allotted 37.1 billion SEK to help those in need, either by receiving asylum seekers or though humanitarian aid at the place of need, or by receiving quota refugees. Of this 37.1 billion SEK, 34.3 billion SEK goes to the budgets for migration and integration in the overall state budget. Migration costs 17,9 billion and integration costs 16,4 billion. The migration budget also includes costs related to working visa immigration as well as Swedish citizens relocating. But the largest portion goes to receiving asylum immigrants. The humanitarian aid portion, which includes quota refugees, is 2.8 billion SEK. This is the amount Sweden has allotted to help people “in place”, including helping quota refugees come to Sweden. Of these 2.8 billion SEK, 885 million SEK goes to the UN’s refugee organization UNHCR. This organization is responsible for the quota refugee system. Last year Sweden took in a bit more than 1,900 quota refugees. The civil war in Syria is one of the worst refugee situations in the world at the moment. According to SIDA, their aid towards the Syrian crises in 2014 totaled 320 million SEK of which 40% went to aid and support of neighboring country’s refugee camps where the majority of Syrian refugees are located, around 5 million in total. That’s a total of 128 million SEK. This means that out of Sweden’s 34.2 billion SEK to help approx 48,700 asylum seekers arriving to Sweden on their own accord, Sweden is spending 128 million SEK on the 5 million refugees living in refugee camps around Syria, the majority of which have no means of going elsewhere. Politics is all about priorities. You can make up your own mind of how the Swedish government prioritizes its money based on all the situations and facts laid out above. The total estimated need of housing for new arrivals who are granted residency (including all reasons for granting residency as well as relatives to granted residents arriving later) is 38,500 homes a year during 2015 and 2016 if the size of household for new arrivals is counted on the same premise as the general population. Of those granted residency and who are expected to remain in the Migrationsverkets own housing facilities by the end of 2016 a total amount of 14,100 new homes are needed. I’d like to cover a few examples of statements which are angled to give a false picture so as to not fuel xenophobia. Let’s analyze this statement against facts. The current wave of refugees does not consist of mainly people fleeing bullets and bombs but consists of those who already have gotten refuge in less attractive countries and seek better welfare and a chance to live in rich welfare states. To receive 0.1 – 0.2 percent of the world’s refugees is not a one-shot deal, but means that Sweden will take in 0.1 – 0.2 % every year. The relevent information as far as determining the economic impact as well as resource calculations is not how much of the total amount of refugees we receive but rather the total number relative to Sweden’s own population. If we take the high estimate by the prime minister, 0.2%, of the 60 million refugees that equals 120,000 who would come to Sweden each year. As a point of reference, roughly 110,000 got granted residency in 2014 of which around 48,700 were related to refugee and asylum seekers in all categories. At this rate, in 40 years people with a foreign background will be the majority population in Sweden. This is a pretty significant piece of information. Possibly this is what the majority of Swedes want to do out of humanitarian reasons, but then this should be clearly communicated by politicians and media, not covered up through a rhetoric of 0.2%. No politician has yet explained how Sweden is going to cope with and tackle these numbers, especially in light of thirty years of failures to integrate around 1 million refugees and their relatives. Foreign-born already account for 40 % of the long-term unemployed while those with a foreign background account for almost half of those with low schooling results and account for almost 60 % of paid out social welfare benefits (socialbidrag). There are plenty of opinions on the subject and many biased analyzes (biased due to omitted data in the calculations) on the subject of whether or not immigrants benefit the economy. If one considers only resident visas granted due to work, this is definitely the case. However, there is no logical evidence that shows that refugee immigrants benefit the economy due to demographic reasons because this category of immigrants work less and pay a considerable less amount in taxes. Immigrants pay roughly 40 percent less in tax as a whole than the rest of the Swedish population, and this includes those arriving on working visas. This massive income gap has increased since 1990, not lessened. If something is getting worse over a 30-year period with high immigration numbers, which factors will make it better in the future unless drastic political changes are implemented? It is also a fabrication that a high portion of refugee immigrants are highly educated. According to SCB only every 10th refugee has a higher education. About half has a secondary school level education. The rest has less than that. The article goes on to criticize Norway’s migration politics using this number, 8,000. What the article completely omits to mention is that that decision of the 8,000 has to do with quota refugees. That’s 2,600 a year for Norway. As a comparison Sweden took in 1,960 quota refugees last year. Norway has a similar percentage to Sweden in granting residence to asylum seekers, however, fewer refugees sought asylum in Norway compared to Sweden. A more emotion-stirring picture and headline could not have been produced. But what do we know about Aylan? This is what we know. Outside of his terrible death, Aylan’s family, while originally from the Syrian border town of Kobani, had actually been living in safety in Turkey for three years – the duration of the time Aylan had been alive. The United Nations High Commissioner for Refugees would not recognize the family as refugees. But Abdullah Kurdi had a sister in Canada, Tima Kurdi, who sent money to help pay the rent. Tima Kurdi applied to Canadian immigration officials to bring in another brother as a refugee, and was asked to supply more information. She planned to later sponsor Abdullah Kurdi’s family, too. She sent her brother the money for people smugglers to leave Turkey in search for a better standard of living in Europe. SVT recently wrote an article with the headline: “Thousands of highly educated flee to Sweden” Realize that in Sweden the word ”highly educated” means a college degree (högskoleutbildad) or higher. A person with a couple of years of on-the-job mechanical training in the Syrian military does not match up to the regular meaning of “highly educated”. According to the SCB roughly 10% of recently arrived Syrians between 18 – 65 years of age are highly educated, compared to 25% of the rest of the population. 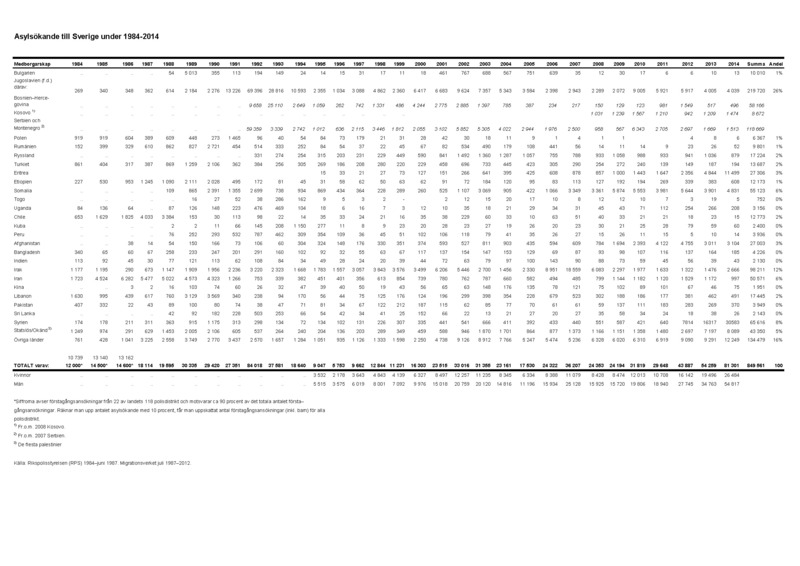 SCB’s data is derived from mainly questionnaires every newly arrived needs to fill in. There is no advantage to exaggerate or lie in a statistical questionnaire, especially presenting your education as lower than it is. To get your education level validated is a matter of a separate process later on and this survey has no effect on such. However, to be counted in the statistic this validation or official documentation is not needed, only the answers from the questionnaire. SVT didn’t mentioned that only 0.3 percent of Syrians arriving in 2014 have a science education? It is noteworthy however that prior to the Syrian civil war in 2011, Syria had one of the highest education levels in all of the Middle East. Others take on a much more radical view such as what Anders Lindberg wrote in Aftonbladet in July: ”Right-wing views can be a hidden disease! Right-wing views can come about from a narcissistic disorder!” One of the keys to the ongoing goodness-debate is here: People on the left, and some liberals, simply don’t understand how people on the right think. They seriously seem to think people on the right suffer of lack of empathy, lack of compassion, sociopathy and general narcissism. There was a study done how accurately people from the left and right view its opposition. In one such test persons from the left, middle and right were tasked to try to see the world from the opposite side’s perspective. (Jesse Graham, Brian A. Nosek och Jonathan Haidt, 2012). Each person was meant to answer questions as if they belonged to the opposite political side. The results of the test showed that people in the middle as well as those on the right could fairly accurately imagine how someone on the left viewed the world. But the further to the left the test person was, the more erroneous his answer became about a person’s perspective on the right. After the statements, “One of the worst things a person can do is to harm a defenseless animal” and ”Equality is the most important requirement for a society”, the people on the left consistently believed that people on the right would not agree. Of course this was not the case. While the people in the middle and to the right could understand how the people on the left were thinking, even if they didn’t agree, many people on the left believed seriously that the people on the right were bereft of compassion and are intentionally unjust and unfair. In the ongoing debate about refugees this is very clearly observable. The people on the left as well as those calling themselves antiracists in many cases seriously believe they are the only ones fighting on the good side. An article from the 9th of September 2015 in Sydsvenskan was titled, “The hate towards goodness!” According to the author, Per Svensson, the critique received by those who sometimes are called ”godhetens riddare” (goodness knights) is a master suppression technique. He states that there are two forces: neo-nationalism/evil and idealism/goodness. Apparently the choice is easy – who wants to be evil? “Our duty is to provide better futures for as many of the displaced as possible — and their overwhelming hope is not to live permanently in Europe, but to return to a post-conflict Syria. Effective rescue should be about salvaging as much of their disrupted lives as possible. Of course, if they are in the sea, rescue involves pulling them out of it. But any action needs to be set within a larger strategy of making people’s return viable. Once parts of Syria return to peace, they will face a fairly standard challenge of post-conflict recovery. Post-conflict situations are politically fragile, and rapid economic recovery helps to stabilise them. The smart way to meet the duty to rescue is to incubate that economic recovery now, before the conflict ends. What are our responsibilities towards all the refugees regardless of if they wish to apply for asylum in Sweden or not? How can we help the most amounts of people in dire need in the most efficient way? Many answer this by putting all beans on receiving refugees, whether or not this is refugees managing to come to Sweden on their own or in the form of a rescue operation, like picking up quota refugees directly from refugee camps. My conclusion is that this is not the case and this has become more and more apparent the more I have learned. For many years now the Swedish government has re-prioritized its budgets and taken money meant for aid and relief support in refugee camps and reallocated it to receiving refugees in the country. ”Finance minister Magdalena Andersson (S) defends the reallocation with ”the uncertain world” which results in that more people will come to Sweden. Right now a whole 21% of aid and relief money is put towards refugee arrivals. How high can this percentage keep rising? Is this sensible and moral politics? Reports from UNHCR about the various crises have made me seriously consider both pragmatically as well as morally if simply an increased intake of refugees really is the best approach for Sweden in the long run. Yes, there is that aspect of what responsibility EU has as a whole as well as the responsibilities of individual EU countries. However, Sweden can only do so much in regards to influencing how EU as well as their individual member countries will act. Sweden is certainly doing its part by already taking in the absolute highest amount of refugees per capita. 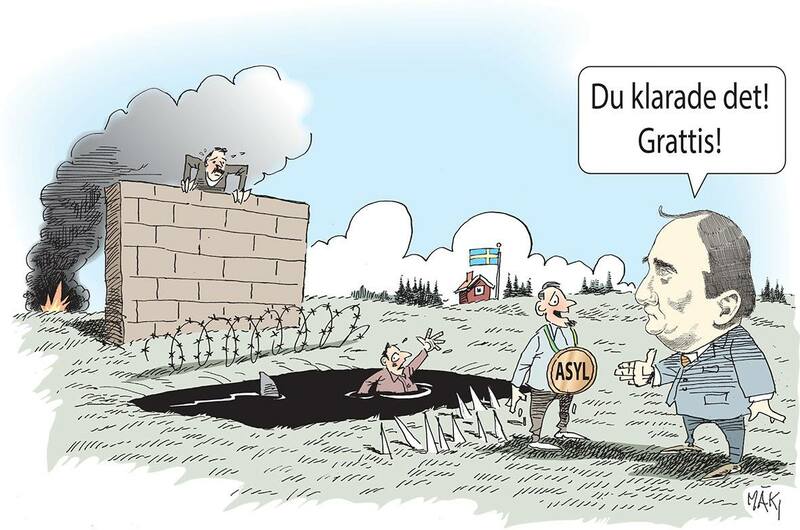 Even the Swedish newspaper Expressen accurately portrays UNHCR’s evaluation of the situation. “We see a clear connection to the worsening condition inside Syria but also to the more and more pressing conditions in other host countries. One such clear example was when the refugees in Jordan received an SMS from the UN’s Food-program (WFP) with the message that there simply isn’t any money left to be able to send them more food. As I see it, the more we allocate our limited money on receiving more refugees, the less money will be allocated to relief and aid towards refugee camps. As this becomes a trend with other countries, the UN cannot keep up with the budget necessary to supply food, water and medicine to the refugee camps. The condition worsens forcing the refugees to leave the camps and search for a better life elsewhere, most likely to places in Europe such as Germany and Sweden. It is a like a downward spiral. The more Sweden focuses on receiving refugees, the less money goes to refugee camps, the more refugees leave their camps and come to Sweden, who needs more money to receive them and takes it from the relief and aid portion of the budget which results in even worse conditions at the camps, resulting in more refugees leaving and try to come to Europe – an evil circle without an end. What does result in the most amounts of help from our limited resources? I don’t have a full answer, but I do believe it is a combination of factors which includes enough aid and relief support to keep the basic life line going in refugee camps, while changing back the rules and conditions for refugees to be more similar to other countries in Europe so as to not attract refugees especially to Sweden due to our current generous and tantalizing benefits. Then the focus from Sweden’s foreign affairs office needs to push EU to effectively and at once deal with the source of the refugee crisis, which for Syria is both the civil war as well as the more recent invasion by ISIL. Sweden could set an example and lead this forward push. There’s no either/or solution but a balance that covers appropriate aid and relief support with an asylum program that focuses on quota refugees according to available social and economic resources. Replace PUT with TUP (Temporary Residence Status) and make it harder to apply for asylum at the border controls. This will decrease dangerous journeys with potential death tolls. Increased pressure on EU and their member countries to play their part, which Sweden as a single nation has less influence on than its internal policies. Primarily with political and diplomatic measures through EU, cease the civil war in Syria and with military measures combat ISIS. I have in this article presented many facts, facets, raw data and various perspectives as well as offered my own conclusion. Facts are accompanied with a link to the source data. Sometimes I have provided a link to an article which explains the source data well, but within that article you will also find the link to the actual source data. My hope is that you read this and make up your own mind. I don’t want to tell you what to think, but rather provide you with as much information as possible for you to draw your own conclusions. Some of what I have written above I have simply translated from existing articles in Swedish media. I’m not trying to “show” that I’m the “writer” in this article. I have simply collated and summarized all the various current pieces of data to be able to present the whole picture as I see it. “For years, Prof Collier writes, rational debate on immigration has been impossible because “policy has been fought over using competing values rather than competing evidence”. The debate was split between the extremes of those who viewed migration as a threat and those who believed that to question it was tantamount to racism…. Prof Collier, who has spent his career studying poor countries, has decided to step into this delicate territory. Exodus, he writes, is not an effort to tell us what to think about immigration but an attempt to create a new framework for how we think about it. For too long policy makers on both sides of the political divide have been asking the wrong question. Rather than arguing about whether immigration is good or bad, they should focus on the optimum degree of diversity. He has created a model he believes is a more reliable way of achieving this goal. It relies on three factors: the size of the diaspora; the idea that migration increases the diaspora’s size whereas ‘absorption into mainstream society reduces it’; and the idea that ‘the rate of absorption depends on the size of the diaspora’. However, says Mr Collier, continued mass immigration threatens the cultural cohesion of rich countries. Some diversity adds spice: think of Thai restaurants or Congolese music. But a large unabsorbed diaspora may cling to the cultural norms that made its country of origin dysfunctional, and spread them to the host country…. Mr Collier is right that there is a tension between mass immigration and the welfare state. A rich country that invited all and sundry to live off the dole would not stay rich for long. Immigrants assimilate better in America than in most European countries in part because welfare is less generous there. In parts of Europe it is possible for able-bodied newcomers to subsist on handouts, which infuriates the native-born. In America, by and large, immigrants have to work, so they do. Through work, they swiftly integrate into society…. I guess it all comes to free-money handed down to refugees. Both Sweden and Germany offer to pay for their expenses just for being refugees. They don’t need to work and can happily get money every month, besides keeping company of their own diaspora making inclusion harder to occur.